This extraordinary Alpine residence in Italy's Brescia province provides stunning views of the mountains that rise 1,200 meters (3,937 feet) above sea level. 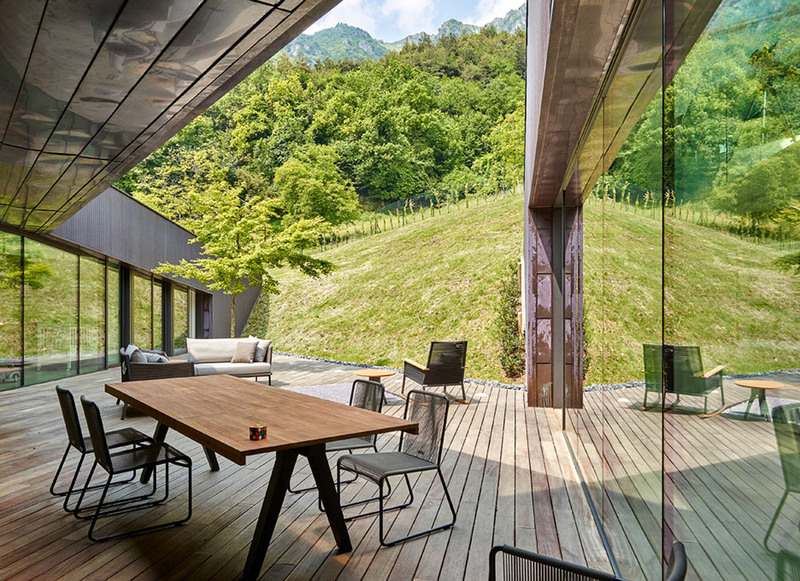 Every point in the interior is visually connected to the natural landscape-a large panoramic window in the living room frames views of the valley, while openings on the rear side provide glimpses of the grassy hillside that meets a sunken courtyard. Architect Camillo Botticini played with the concepts of harmony and tension between the building and the site, both through the structure and choice of materials, and incorporated sustainable technologies to curb the building's energy consumption. 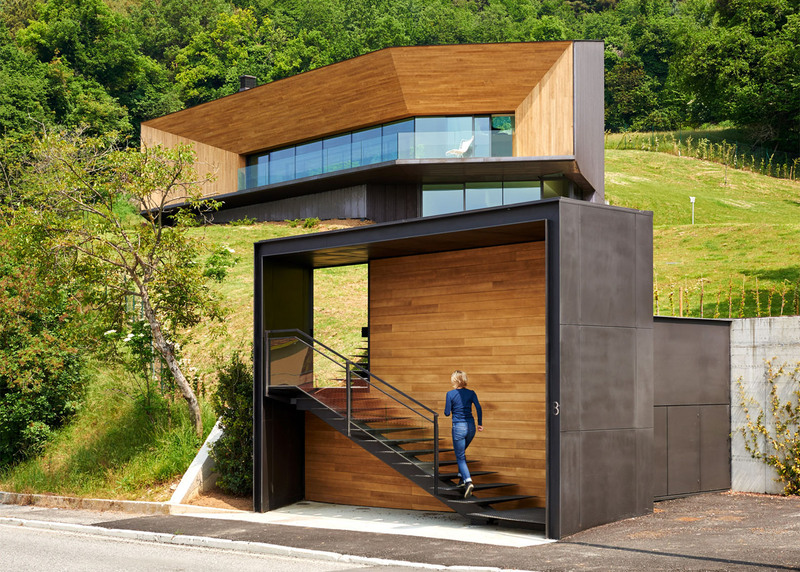 The house is rooted to the hillside near the Passo del Cavallo pass in the Alps. A suspended metal staircase cuts through the grassy slope and connects a small entry area to the house above. The glazed entrance is sheltered by a broad window and a terrace. “We are still in a place close to the urban noise but at the same time far away, where the aroma of mountain herbs and grazing sheep seem to have stopped time,” said Botticini about the location of the building. The house uses geothermal energy, features well-insulated walls and natural ventilation. Treated Accoya wood and sheets of pre-rusted corrugated copper dominate the material palette of the house. The ventilated wall copper and the wood were used in a way which reflects light for more daylighting. Inside, the C-shaped layout wraps around the iroko wood patio. In order to blend into the surrounding, the house changes in height and includes a mezzanine with a study above the living area, while the kitchen is nestled beneath and opens up onto the patio. The house is rooted to the hillside near the Passo del Cavallo pass in the Alps. A suspended metal staircase cuts through the grassy slope and connects a small entry area to the house above. The glazed entrance is sheltered by a broad window and a terrace. "We are still in a place close to the urban noise but at the same time far away, where the aroma of mountain herbs and grazing sheep seem to have stopped time," said Botticini. The house uses geothermal energy, features well-insulated walls and natural ventilation. Treated Accoya wood and sheets of pre-rusted corrugated copper dominate the material palette of the house. The ventilated wall copper and the wood were used in a way which reflects light for more daylighting. Inside, the C-shaped layout wraps around the iroko wood patio. In order to blend into the surroundings, the house changes in height and includes a mezzanine with a study above the living area, while the kitchen is nestled beneath and opens up onto the patio.